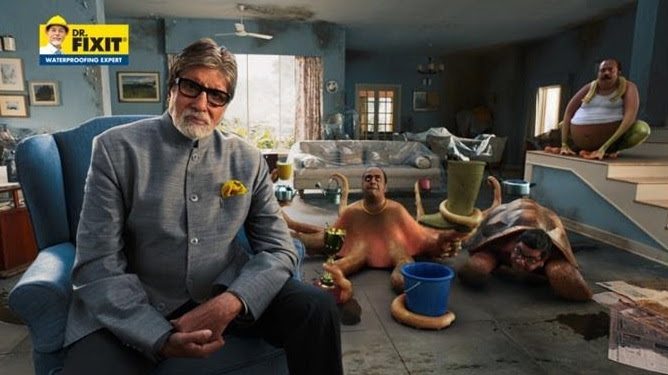 Mumbai (Maharashtra) [India], Apr 1 (ANI/NewsVoir): Dr. Fixit, from the house of Pidilite, unveiled its new TVC campaign on Monday featuring superstar Amitabh Bachchan, along with an interesting set of aquatic creatures. The TVC urges homeowners to avoid taking a shortcut while constructing their new home and engage in “total waterproofing” with Dr. Fixit, to avoid future cost and damage to their homes. The latest Dr. Fixit campaign addresses the shortcuts in waterproofing that people usually take while constructing their homes. Most people, while constructing a new home, leave waterproofing on others, or don’t pay attention towards it and sometimes even consider it as an unnecessary expense. The TVC underlines the fact that skipping waterproofing can cost even more in the long run, because of the damage that leakage and dampness can cause. The TVC draws attention towards how Dr. Fixit “Total Waterproofing” can safeguard your home and your investment; from unforeseen embarrassment in the future. But most importantly, it urges the consumer to reach out to the Dr. Fixit brand, so that that they can receive the comprehensive “Waterproofing Guide.” This will guide them on waterproofing products and services; in a simple manner. The campaign constitutes of three films featuring Bachchan and an aquatic creature symbolizing embarrassments that customers face when they adopt shortcuts. The TVC shall be aired during IPL season, also on key GEC, news channels and digital platforms. The first ad campaign opens with Bachchan playing himself. He is shown standing next to a turtle shell. “Yahan hain Sharmaji…Sharmaji bahaar aayein na, apne hi log hain,” he says. It then showcases Sharma’s head popping out of the turtle shell. Looking at Sharma, Bachchan explains that while constructing his new house he opted for a shortcut and relied on others for waterproofing. He then looks at the camera and appeals to customers to use Dr. Fixit Total waterproofing while constructing your new house or else face embarrassment like Sharma. The second film opens with Bachchan sitting in a waterlogged house and speaking to the camera, when an octopus’ tentacle creeps up his hand and takes away a cup he is holding. There he introduces ‘Gupta-ji’, an octopus appropriating many household items to catch water leaking from the ceiling. Bachchan then explains the importance of waterproofing while constructing a new house; otherwise, life will be as complicated as Gupta-ji’s. The third one, meanwhile, opens with Bachchan standing next to ‘Mr. Makhija’, a frog, speaking to the camera. Talking to Mr. Makhija, he says, “Makhija ji ne ghar banate waqt laparwahi ki, shortcut liya aur waterproofing nahi ki. Ab Sharma ji apne hi ghar me fudak fudak ke chal rahe hai.” Bachchan explains that if you don’t use Dr. Fixit while constructing the house, you have to face difficulties like Mr. Makhija and live like a frog in your own house.